Jewelry for Nurses, Firefighters, Family and Friends. As the world whisks by in constant motion, keeping our lives in balance and finding those moments of peace become more important. Sometimes the answer is as simple as treating yourself! Now, you can do just that with the sparkling Serenity Journey Ring, a fine jewelry design exclusively from The Bradford Exchange. This dazzling gemstone ring is a cascade of blissful blue beauty that is sure to become a favorite in your jewelry wardrobe! Expertly handcrafted in gleaming solid sterling silver with 18K gold-plated accents, this stunning gemstone ring features a journey-style band with its graceful waves leading to six magnificent gemstones. The striking gems on this ring each has its own beauty and unique story, but together they elegantly represent the journey of serenity. Bringing inspirations, the ring includes white topaz, which has been long-believed to bring purity of thought; turquoise known for its protective and healing energies; sky blue and Swiss blue topaz often associated with soothing and calming properties; aquamarine correlated with peace; and Larimar, which was thought to bring balance and serenity. Strong demand is expected for this elegant and inspiring jewelry, so don't miss out - order now! Faith brightens life with joy and a sense of serenity that brings comfort knowing God is with us at all times. There's nothing more fulfilling than accepting His unwavering love. Now, you can share the beautify of God's love wherever you go with this stunning Light Of Faith Blue Topaz And Diamond Ring, a fine jewelry design exclusively from The Bradford Exchange. Handcrafted in solid sterling silver, this sparkling blue topaz diamond ring features four genuine marquise-cut blue topaz stones set to form an openwork cross. At the center of the cross gleams a genuine diamond surrounded by two more diamonds, which represent the holy Trinity. Plus, engraved inside the band is the comforting message, "Always With You", a reminder of God's infinite love. High demand is expected for this Christian women's ring, so order now! There's something truly dreamy about the serenity of aquamarine waters and the mysteries they may hold. Why, they may even shelter an elusive mermaid or two! Now you can possess the soothing shimmer of ice-blue waters and the legendary treasure of mermaids - aquamarine - with this Dream Ring, a fine jewelry design exclusively from The Bradford Exchange. A dream come true, this stunning aquamarine and white topaz ring is meticulously handcrafted of gleaming sterling silver with solid 10K rose-gold accents.This lovely sterling silver ring showcases a gorgeous genuine aquamarine center stone surrounded by a cluster of genuine white topaz gems that also flow down part of the band. This Dream Ring is a stunning complement to any woman's wardrobe and also makes a beautiful gift for someone special; it even arrives in a custom presentation case, perfect for safekeeping and gift-giving. We expect strong demand. So, don't delay. Order now! From asking how her day is to taking an interest in her favorite hobby, you love sending and getting text messages with your beautiful granddaughter. Now you can express the wishes in your heart with a special jewelry keepsake that means so much more than a cell phone text. Introducing A Message of Love Bracelet, a fine jewelry design exclusively from The Bradford Exchange. Inspired by the playfulness and popularity of emoji and eye-catching fashion style, this charm bracelet features 5 emoji charms, and a special heart charm at the clasp accented with a clear crystal and is personalized with your granddaughter's name on one side, and "I Love You" on the reverse side. Exquisitely handcrafted with sterling silver- and rich 18K gold-plating, this emoji bracelet features 6 sparkling faceted crystal beads, and 5 unique emoji charms are plated in 18K gold with hand-enameled accents. The back of each emoji charm is finely engraved with the special wish it conveys to your granddaughter: Happy, Smart, Love, Laugh and Faith. These heartfelt sentiments are also expressed in a unique fun card that reads like a text message to your granddaughter. This one-of-a-kind granddaughter jewelry arrives in a velvet jewelry pouch and gift box, perfect for safekeeping or gift-giving. And it even comes with a 1" extender. Tremendous demand is expected, so don't delay. Order now! Every time you text message your granddaughter, your heart smiles when you press send. Now you can tell her how much you love her with an extra touch of sparkle that no smartphone can convey. Introducing A Message of Love Personalized Pendant Necklace, a fine jewelry design exclusively from The Bradford Exchange. And the best part of this emoji pendant necklace is a heart charm at the clasp of the necklace that is personalized with your granddaughter's name on one side, and "I Love You" on the reverse. What a fantastic tribute to your incredible bond. Finely handcrafted and lavishly plated in sterling silver and rich 18K gold, this personalized pendant is hand-enameled in the shape of an emoji "kiss" that incorporates 6 sparkling red crystals in the heart. The back of the pendant is engraved with the message "My Darling Granddaughter, Sending you Love Every day". The pendant dangles from a coordinating 18-inch chain and the bail gleams with 4 clear crystals for added sparkle. This personalized jewelry arrives in a velvet jewelry pouch and gift box along with a unique fun card that reads like a text message to your granddaughter. This one-of-a-kind pendant necklace is sure to make your granddaughter smile again and again. Strong demand is expected, so don't wait. Order now! A mother's love for her family is never ending. Celebrate the love, strength and infinite joy of your family with the Family Is Forever Personalized Ring, customized with up to 6 crystal birthstones to represent your loved ones. This fine jewelry creation is an exclusive design from The Bradford Exchange, featuring a unique center band that actually spins to reveal each birthstone. Handcrafted and lavished with sterling silver plating, it's a spectacular treasure to keep your loved ones near! This personalized spinning women's ring features two outer bands sparkling with clear crystals, and a gold-toned infinity pattern on the center band that wraps around each family member's birthstone. In addition to the unique spinning design of this women's ring, it is also engraved with the sweet words, "Our Family is Forever" for an extra-special touch. Rings with less than 6 birthstones will be set with clear crystals for sparkling radiance. A terrific gift, the ring arrives in a custom presentation case with a heartfelt poem card. Strong demand is expected, so hurry - order now! Disney's beloved Mickey Mouse has been sharing his magic of laughter and fun with the world since 1928. Now celebrate his 90th anniversary in November 2018 in a stylish and unique way with the Mickey Mouse Forever Ring, a fine jewelry design from The Bradford Exchange. This custom-designed women's spinning ring is handcrafted, plated in gleaming sterling silver and features nine classic moments of Disney's Mickey Mouse. Licensed from Disney, the artwork that adorns this fine jewelry has been carefully recreated and hand-applied along the ring's spinning center band to look like a filmstrip. As the ring spins, the artistry creates an animated effect. Above the spinning band is a fixed, hand-enameled Mickey Mouse charm. The inside of the band is engraved with the words "Mickey Mouse Forever" for the perfect finishing touch. This remarkable Disney jewelry is a wonderful way to celebrate the endless magic of Mickey Mouse and strong demand is expected. So, order now! Fashionable, fun and fabulously flirty, no one knows how to steal the spotlight quite like Betty Boop™. Celebrate this darling diva with a little fashion fun with the Forever Betty Boop Pendant Necklace, a fine jewelry design exclusively from The Bradford Exchange. This classic design brings together Betty Boop fun and high-end style for unforgettable Betty Boop jewelry. Lavishly plated in rich 18K gold, this women's Swarovski crystal pendant features a heart-shaped design that gracefully twists into a symbolic infinity symbol showcasing 12 sparkling Swarovski crystals. A spectacular, officially-licensed Betty Boop image sits at the bottom of the pendant for added sparkle. This pendant is also engraved with "Betty Boop™ Forever", and at the clasp is a red enameled kiss-shaped charm engraved with "Boop-Oop-A-Doop™" on the reverse. Your stunning Betty Boop jewelry arrives in a custom gift box for the perfect finishing touch. Strong demand is expected, so don't delay. Order now! Sassy, fun and totally adorable, Betty Boop™ is definitely a colorful character! Now, you can bring her sparkling charm to your wardrobe with the Betty Boop™ Ring, a fine jewelry design exclusively from The Bradford Exchange. Exquisitely handcrafted from solid sterling silver, this distinctive ring features twin bands - one in silver and one plated in 18K gold. At the center of the ring is a sculpted Betty Boop in a flirty pose adorned with colorful enamel. The bands are embraced with two dazzling pave ribbons of Diamonesk® simulated diamonds. Our exclusive Diamonesk simulated diamonds give you the flawless brilliance of the finest genuine diamonds - but at a fraction of the cost. The inside of the band is engraved with Betty's signature catchphrase, "BOOP-OOP-A-DOOP!™", making this unique ring a sassy expression of style for women everywhere! This fashionably fun ring is sure to cause a sensation every time you wear it and it also makes a wonderful gift for a girlfriend who likes to put a little sass in her style. Your Betty Boop Ring arrives in a custom presentation case, perfect for safekeeping and gift giving. Strong demand is expected. Order now! When duty calls and the alarm sounds, they rush to the scene, risking their own lives to save others. Our brave firefighters are a rare breed and truly, our everyday heroes. Now, The Bradford Exchange is delighted to bring you a fine jewelry exclusive that is sure to fill any firefighter with pride: The Firemen Ring. This handsome men's 24K gold-plated solid sterling silver ring is individually handcrafted with a raised-relief Maltese Cross - every firefighter's badge of honor - at its center, set against an inlay of genuine black onyx. Scenes of firemen in action are sculpted in relief on each side of this impressive ring. As the final touch, the ring is engraved inside with the words "Duty", "Honor" and "Courage". This striking tribute is the perfect way to show allegiance to the profession and makes a meaningful firefighter gift; it even arrives in a custom presentation box, perfect for safekeeping or gift-giving. Strong demand is expected. So, don't delay. Order now! Firefighters bravely put their lives on the line every day! Now you can honor their courage with this sparkling firefighter crystal heart pendant necklace. This stunning multi-faceted crystal heart is handcrafted with the image of an American flag embedded within. The heart is topped with a sculpted firefighter's Maltese Cross in solid sterling silver and accented with 24K-gold plating. The words that firefighters live by every day, "Valor, Strength, Bravery", are etched in script on the back of the pendant. This gleaming firefighter pendant is a fine jewelry design exclusively from The Bradford Exchange, and comes with a decorative 18" solid sterling silver rope chain. It arrives in a deluxe velvet pouch and a gift box perfect for safekeeping. This Pendant makes a meaningful keepsake for yourself or a heartfelt gift. High demand is expected, so order now! Ahhh, Venice. No other city in the world shimmers with the light and romance of The Floating City. 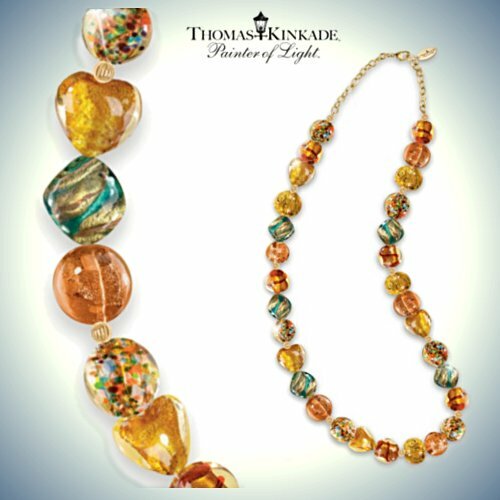 It seems quite natural that Thomas Kinkade, Painter of Light™, would be drawn to the luminous enchantment of Venice, and now his visions of Venice inspire a true, one-of-a-kind necklace: the Thomas Kinkade Colors of Venice Necklace, boasting a spectacular fine jewelry design exclusively from The Bradford Exchange. A fashionable interpretation of Thomas Kinkade's glorious artwork, this exquisite beaded art-glass necklace is as beautiful and unique as Venice, and now this wearable work of art is yours to enjoy every day.This one-of-a-kind necklace is handcrafted of individually sculpted, uniquely shaped Murano style glass beads, which means that no two necklaces are alike. The colors of the beads, inspired by the palette of Thomas Kinkade's gorgeous painting, "Venice," vary in color from rich gold, umber, and mahogany, to delicate aquamarine and blushing rose; selected beads also feature delicate layers of 24K gold-plated foil embedded within, forming intricate patterns. Smaller round beads plated in 24K gold separated each art-glass bead. The beads are crafted onto an adjustable 20" necklace, and a 4" extender is included. A 24K gold-plated Thomas Kinkade signature tag featuring the artist's name and logo provides the perfect finishing touch. Your necklace arrives in a beautiful presentation box adorned with Mr. Kinkade's art "Venice." Intense demand is expected for this exquisite necklace, so don't wait. Order now! Bringers of comfort and care that seem guided by the divine, nurses are an inspiration to us all. The healing touch of these earthly angels of mercy is shown everyday in the selfless attention and compassion each patient receives when needed most. Imagine the honor and pride your favorite nurse will feel when receiving this gorgeous piece of nurse jewelry!Now, you can pay tribute to this noble profession with this splendid keepsake jewelry, exclusive sterling silver and diamond heart-shaped pendant jewelry, with 24-K gold plating, from Bradford Exchange. 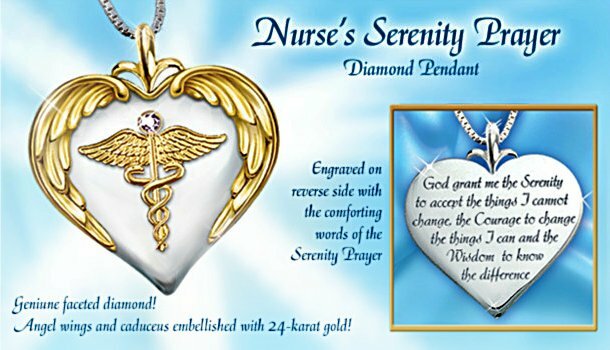 Serenity Prayer jewelry that makes the perfect nurse gift, brisk demand is expected for this nurse jewelry. Order now! Celebrate your everlasting bond with a loved one! This beautiful sterling silver heart pendant is an elegant work of fine angel themed jewelry, exclusively designed to honor the spirit and memory of someone special. Finely crafted and accented with rich 24K gold detailing, it is graced with an enfolded angel-wing design and a sparkling teardrop-shaped Swarovski crystal. The reverse side of this fine keepsake jewelry is engraved with a comforting sentiment.This exclusive sterling silver heart pendant remembrance jewelry from The Bradford Exchange makes a wonderful bereavement gift to give or a lovely keepsake to cherish. Soothe a heart and honor a loved one - order now! Nurses bring healing comfort, compassion and hope to some of the most challenging times in life. Now, celebrate nursing in a stylishly beautiful way with this dazzling charm bracelet for nurses, a fine jewelry design exclusively from The Bradford Exchange. A shining tribute to those who give so much, it's the perfect expression of the love and kindness that fills a nurse's heart. Exquisitely handcrafted, this radiant jewelry for nurses features 11 sterling silver-plated charms on a sterling silver-plated link bracelet. There are four symbolic sculpted charms - including a stethoscope, medical caduceus symbol, nurse's cap, and angel - and four luminous pink glass bead charms. 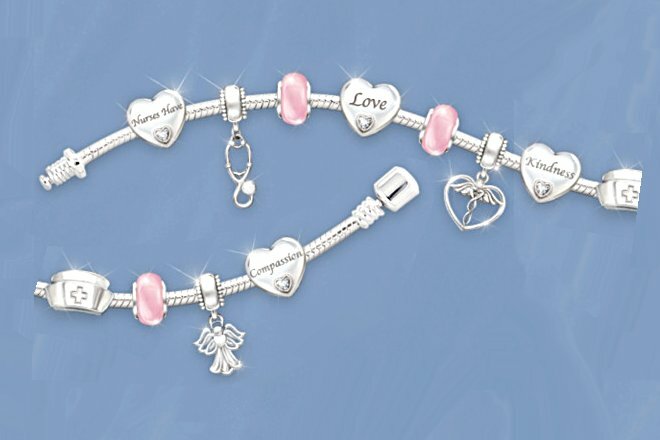 In addition, four solid heart charms sparkle with genuine Swarovski® crystals, and are engraved front and back; together they spell out a special nursing tribute. It's the perfect keepsake for you or a thoughtful gift for a nurse, but strong demand is expected, so don't delay. Order now! Your loved one made life richer by filling it with joy. There is a special comfort in knowing they are watching over you as their spirit lives on in your heart, and this Always With You Ring is the perfect way to honor that everlasting bond. A fine jewelry exclusive from The Bradford Exchange, it is specially designed with a genuine white topaz, creating a dazzling women's ring that symbolizes all the beautiful memories you made together and which you will cherish forever.This exquisite solid sterling silver ring is handcrafted and plated in shimmering 18K gold. The distinctive sculpted angel wing design is inspired by those who watch over us, and gracefully embraces the impressive pear-shaped genuine white topaz gemstone. For added meaning, the word "Always" is elegantly engraved inside the band. This stunning women's ring even arrives in a custom presentation case with a touching poem card, making it the perfect keepsake for you or a special gift for someone close to you. Strong demand is expected, so hurry. Order now! Give a beautiful inspiration for your precious granddaughter with a touching message of faith from an angel and surrounds her with God's eternal love, with the Blessings from an Angel Diamond Pendant Necklace, a fine jewelry design exclusively from The Bradford Exchange. Exquisitely handcrafted of solid sterling silver, this lovely necklace is inspired by delicate angel wings and features an open scrollwork angel wing that suspends from a cross-shaped bail. At the center of the cross is a sparkling genuine diamond, which adds even more radiance to this stunning granddaughter angel wing necklace. As the perfect final touch, the pendant suspends from a matching solid sterling silver chain. Your Blessings from an Angel Diamond Pendant Necklace arrives with a touching poem card in a velvet jewelry pouch and gift box, perfect for safekeeping and gift giving. Strong demand is expected. So, order this angel's shimmering message of faith and love for your granddaughter now! Honor the rich history of American Western cultures with a stunning men's ring inspired by a legendary Native American icon, the thunderbird. Considered a supernatural bird of great power and strength, the thunderbird's name comes from the belief that the beating of its enormous wings causes thunder and stirs the wind. Now the Power of the West Ring unleashes the wild spirit of the Thunderbird, showcased in a dramatic fine jewelry exclusive from The Bradford Exchange.This striking ring is individually handcrafted in solid sterling silver enhanced with 18K-gold plating. At its center it features an impressive hand-set genuine turquoise cabochon, while the sides of the ring depict a thunderbird with a genuine turquoise inlay, highlighted by decorative motifs and borders inspired by traditional Native American designs. The words, "HONORING THE AMERICAN WEST" are boldly engraved inside the ring's band, adding the perfect finishing touch. Your ring even arrives in a custom presentation case. It's the perfect addition to your wardrobe of American Western style jewelry or an outstanding gift for someone special, but very strong demand is expected for this distinctive Power Of The West Ring, so don't wait. Order now! 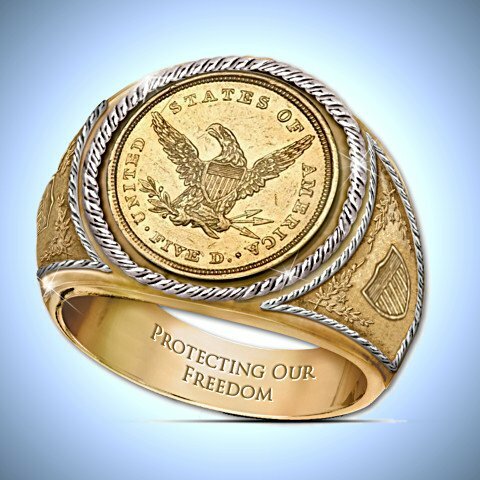 Claim a golden vision of America's treasured liberty with The 1839 $5 Eagle Proof Men's Ring. Bold and courageous, the eagle was chosen by our Founding Fathers as a proud symbol of our freedom, and ever since this majestic bird has graced treasures like the 1839 U.S. $5 Eagle. It was the only coin struck at all seven United States branch mints, but, due to rising gold prices, historic restrictions on gold coins, and time, few of those coveted coins remain.Now the stunning reverse side of that rare gold coin has inspired this spectacular five dollar eagle proof ring. A fine jewelry exclusive from The Bradford Exchange Mint, this dramatic ring is handcrafted, recapturing the majesty of Engraver John Reich's 1807 heraldic bald eagle design in extraordinary detail. The eagle centerpiece is finely displayed in a setting richly plated in genuine 24K gold. The sides of the ring recall the shield design that was featured on the original coin's eagle reverse design, while the inside of the band bears an engraved sentiment: "Protecting Our Freedom." Strong demand is expected for this highly collectible ring, so hurry. Order now! Spread your wings and soar to newfound heights with the most fearless bird in flight, the magnificent bald eagle! Together with this mighty bird you can express your bold sense of style, power and individuality with our Strength And Pride Ring, a fine jewelry design exclusively from The Bradford Exchange.Exquisitely handcrafted in tough-as-an-eagle stainless steel, this striking men's ring features a fully sculpted 3-dimensional eagle head in rich intricate and realistic detail that impressively shows the bird's majestic yet fierce expression. Two genuine black sapphire stones are set as the eagle's mighty eyes while the striking statement "Unleash the Power" is engraved inside this handsome band. Strong demand is expected for this stunning eagle ring, so order now!